Did you know that Mexico was once contemplating on banning mustaches? True story - all the Mexican women in the vicinity were so threatened by this decree, that they had to shave every single day. I heard this tale from Director: Jared Hess; and Actors: Jack Black, Ana de la Reguera, and Héctor Jiménez. They told it to me in 2006, and it took them a whole 88 minutes to do this. Honestly. Somewhere in a Mexican Orphanage, there is a monk who goes by the name of Ignacio (Jack Black). By day, he tends to the orphans in this place of worship - and by night, he worships becoming a luchador (Mexican wrestler). That's right - a luchador - a vocation which is frowned upon in this holy place, and a temptation which Ignacio tries his best to resist by tendering to his holy duties. However, by happenstance and by fate, Ignacio’s resistance is repelled by two factors that come his way. Firstly, due to the presence of a new Nun, Sister Encarnación (Ana de la Reguera) - whom he wishes to impress. And secondly, due to a kinship he discovers with street urchin, Steven (Hector Jimnez) - who once stole some chips from him and wants to be a luchador too. Ooops! Big mistake - because together, both Ignacio and Steven form a tag-team partnership, and go forth into becoming prized luchadores. Worst still, is that they are just sh*t at this task – even if they do get paid for loosing. Nevertheless, a cycle does begin – in which Ignacio upgrades his masked costume – he and Steven looses to a procession of luchadores – they get paid – and the children get to eat something more extravagant at meal time. Still, it does not take a genius to figure out, that after a while, Ignacio becomes fed up by loosing all the time, so he he tries to improve himself by any means necessarily. Initially, by drinking a raw eagle’s egg under the advisement - which does not work. Then, by allying himself with the best luchador in Mexico, Ramses, by gate crashing his party with Steven - which does not work either. And finally, by partaking in a battle royal between eight luchadores, for the right to fight Ramses for a cash prize - which, by luck, he comes second in, only for the orphanage to 'out' Ignacio in the process. Ohh! Poor Ignacio! What is he supposed to do now? Go into the wilderness, and prey to god for forgiveness in partaking in this shunned sport? Yeah - he can do that. What about if Steven somehow engineers a way for Ignacio to fight Ramses whilst this is going on? Yeah - that would be nice too. Which is why what next transpires is a defining moment of truth – Ignation Vs Ramses – where of one them is unmasked – one of them looses - and one of them wins the day. Can you guess who? I can – I can. (Filmic pun alert). In my most humble opinion, 'Nacho Libre' is a film that appears to be made by a very artistic, masochistic, and serious child. Now this is not a criticism by any stretch of the pant. Oh no! But rather a statement of fact if you look very closely at this movie. The script is naive in content - the direction is bold and vivid - and the action that takes place in and around the ring is very painful to the eye. Again, I do not mean this to be a slight, because this is a very definitive and innovative take on a comedic film. And my God, is it comedic! 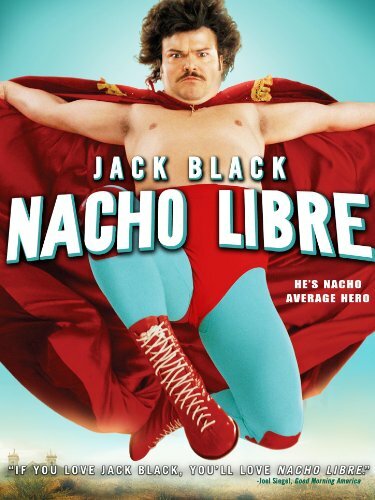 From start to finish, the style of this film just elevates 'Nacho' far beyond those ‘other’ jovial movies that try so hard to make you laugh. OK, on occasion, the jokes do appear somewhat forced – but I just put this down to Jack Blacks 'hammy' acting. Overall, though, this film is a laugh riot of silly puns, sexual innuendo, archetypical accents, and slap-stick silliness – with an emphasis on the slap. Personally speaking, I found that each of the wresting scenes were just great to watch - and even if I could guess from the start that Jack and Héctor were going to loose - I still wished deep down that they would win. But as I said before, this film is a very cleaver film, and in a roundabout way takes a shed load of filmic references, jumbles them all together, and then makes them new again. I like to think of 'Nacho Libre' as a combination of Woody Allen’s film ‘Bananas ’, Wes Anderson’s film ‘The Royal Tenenbaums ’, Sylvester Stallone’s film ‘Rocky ’, and the Bud Spencer and Terence Hill film ‘Trinity ’. You watch all of them once after the other, and then watch 'Nacho', and you will see what I mean. Though, I have to confess, this film does have a down side - as Jack Black does break character whenever he sings, and the ‘love interest’ part of story does feel a bit flat.